Our surgical facilities consist of a large operating theatre and a preparation room. The operating theatre is linked to 2 padded and heated recovery rooms by an overhead electronic rail for lifting horses between the rooms. One of the recovery rooms is equipped to allow assisted recoveries in high risk patients. Access to the surgery suite is restricted to authorised personnel for biosecurity reasons and meticulous cleaning of surfaces is performed to ensure that the facility remains as clean as possible. We provide full anaesthesia facilities including ECG, blood pressure monitoring and pulse oximetry. 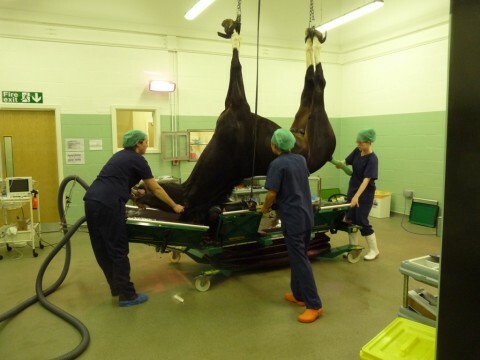 General anaesthesia is performed exclusively by veterinary surgeons to allow the surgeon to focus on the surgery with the confidence that anaesthesia is being constantly monitored by trained veterinary anaesthetists. Using state of the art surgical equipment we aim to take care of your surgical needs both on an elective and emergency basis. Our surgical service is provided by a certificate holder in equine orthopaedic surgery having over 20 years experience. Airway surgeries including hobday's procedure, palate firing, tie-backs and tie-forwards. We have a non slip rubber floor and set of stocks with surgical lighting suitable for standing surgery procedures. This facility along with a combination of sedative and anaesthetic drugs allows us to perform surgeries without the risks associated with general anaesthesia. This often leads to a reduced post-operative recovery period for the patient.